Please plan on being at Keene Run at 7PM sharp. This is the main event for the reunion. We will gather there for a meal and some reminiscing. The Keene Run Golf Course is located just south of Lexington on Harrodsburg Road. The golf course entrance address is listed at 5600 Harrodsburg Road, Nicholasville, KY. The entrance to the access road to the clubhouse is prior to the golf course entrance, if you are traveling outbound on US 68/Harrodsburg Road from Lexington. 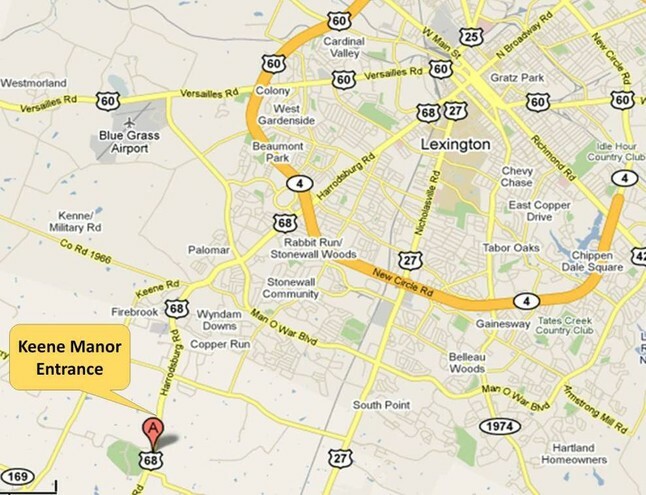 Traveling south from Lexington, turn right at the Keene Manor entrance, which is 3.3 miles south of the intersection of Man O’War and Harrodsburg Road (US 68), or 4.7 miles south of the intersection of New Circle Road and Harrodsburg Road (US 68). As you progress south on Harrodsburg Road (US 68) towards Keene Run, you will see two very large churches on the crest of a hill on your left. One-half mile past this at your first available right is the stone-gated entrance to Keene Manor. Sunset will be around the time this event is scheduled to start at 7PM. If dark, look for yellow and orange glow stick markers near the entrance. Dress code for the clubhouse is "business casual" and no jeans. If you are using a GPS device, using the 5600 Harrodsburg Road address may take you past the Keene Manor entrance and into the golf course entrance. Instead, use the actual coordinate settings of the clubhouse: N 37deg 57.679’ W 084deg 36.153’. If all else fails and you're lost, call my cell: 859-227-4585. This content will copy and paste.